Interestingly, neither Lawrence nor Jane are found in the 1861 U.K. Census. It's conceivable that Jane married, in which case I wouldn't know her married surname. I remembered that Andrew's first wife was Jane Barron who died before 1863 when Andrew married Elizabeth Laws. Of course, there's no certainty that these are Andrew Doyle's sister, brother, and first wife. 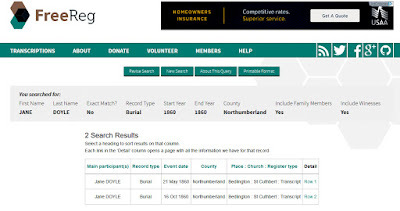 With high hopes I ordered death records for both Jane Doyles, Lawrence Doyle, and a marriage record for Jane Barron and Andrew Doyle. Will there be enough information them to confirm that these are my Doyle family? You can never tell how much information you'll find on the U.K. death records. Good for you ordering the records, especially since you are not sure if they are relevant. I look forward to reading what you find. I didn't think there were any other reasonable options, Wendy, especially because I'm trying to be accurate. I hope they turn out to my family and, especially, that the records give me enough information to know that.